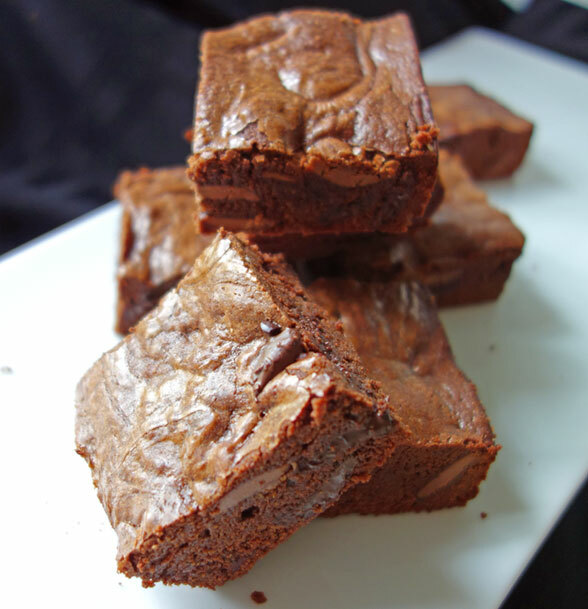 This brownie recipe and I share a lot of history. I started out using the recipe on the back of the Baker’s Chocolate box (who else can remember the disappointment when you bit into a block of Baker’s unsweetened chocolate? YUCK!). Back then, I’d chop up milk and dark chocolate Hershey’s bars to make them “triple chocolate”—Hey, we didn’t have a lot of chocolate choices back then. I thought I was very clever at the time. This was probably the first thing I made when I found out that the doormen at New York’s hottest nightclubs loved sweets and could be bribed. I became the Magic Cookie Lady and baked my way into the clubs every night. The doormen would part the crowd like the Red Sea when I’d show up. We’d exchange air kisses and I’d slip em some sweets. MY entourage and I would get in for FREE! 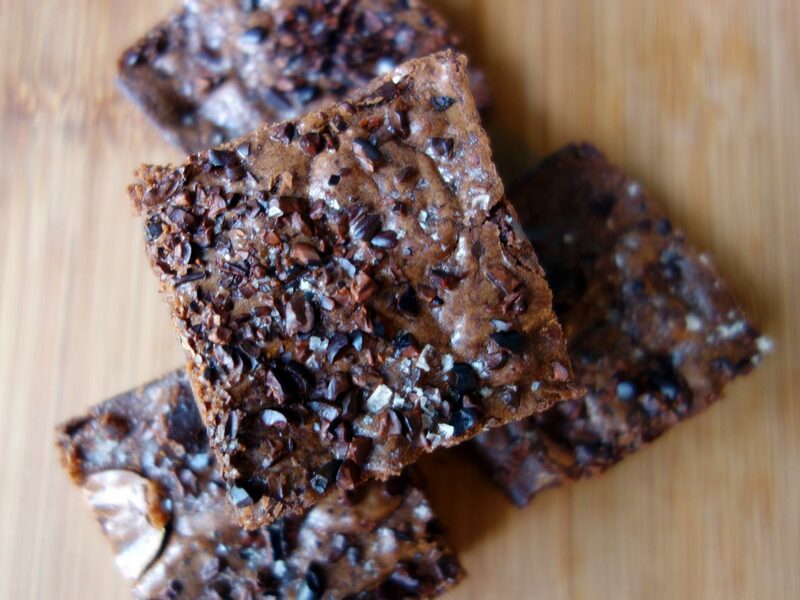 I recently made these for New York Women’s Culinary Alliance Potluck using Guittard chocolate, Kerrygold butter and added chopped cacao nibs and sprinkled them with flaky pink salt. Then I popped the rest in my purse and gave them out to friends at Tale, my girlfriend’s storytelling show in the East Village—the Magic Cookie Lady strikes again! Two people, who had them, told me later, they actually dreamt about them. Feel free to improvise by adding varying types of chocolate, nuts, seeds, salts etc. Brownies are very flexible! As you can from the picture of the Salted Cacao Nib Crusted Triple Chocolate Brownies above. 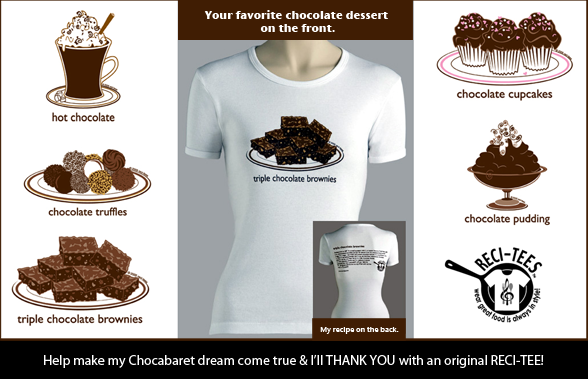 This is one of the first recipes that I made repeatedly which is why it inspired the first RECI-TEE t-shirt I designed. In the Stone Age, as I refer to my youth, I thought it was very clever of me to chop up Hershey’s milk and dark chocolate bar and mix them into the batter for these. In a small saucepan, melt butter. Remove from heat, add chocolate and stir till melted. Cool. In a medium bowl, whisk eggs, sugar, vanilla and cooled chocolate mixture. In a small bowl, mix flour, baking powder and salt. Add flour mixture to chocolate mixture - do not over beat. Stir milk and dark chocolate chunks and nuts. Pour into a greased 9” x 9” pan. Bake for about 25-30 minutes until the brownies are set, but not dry. Cool. Cut into 16 (4 by 4) squares.